Are miracles part of the normative Christian life? Consider the following situation. You are, as is normal, running late, but you made a promise that you would stop at the supermarket on the way home. As you approach the parking lot, you notice that it is packed. The only spots are far away from the store and to park in such a remote location will cost you an extra 10 minutes…10 minutes you don’t have. So, you pop up a prayer to God asking Him to prepare the perfect spot for you— a spot directly in front of the door. You see a person get into their car just as you begin entering the lot. Sure enough, by the time you get there, the spot is vacated and you have that perfect parking spot right by the door. You thank God for miraculously providing the perfect spot and keep you track for getting home on time. But is this really a miracle? The above example is not a miracle at all, particularly because it could have happened to anyone. However, it is possible that this is part of God’s provision. So, let’s look at the various types of unusual events. Hopefully, this will help us understand how God works in our lives. As we go through life we see a number of different sorts of unusual events. There are six types of such events—Anomalies, Magic, Psychosomatic events, Satan Signs, Providence, and Miracles. Let’s briefly examine each of these. An anomaly is an unexplained freak of nature—these events deviate from what is standard, normal, or expected. I spent a lot of time analyzing experimental data when I worked as a research scientist. In fact, I was an expert at statistical and mathematical analysis. Scientists tend to set up highly repeatable experiments and then they take multiple measurements of the replicated trials. In many experiments, the scientist will confront a measurement that fails to match up with the rest of the data points. We would call the outlier an “anomaly.” This is a code by the scientist to say that for some unknown reason an error cropped into the experiment. It could be an incorrect treatment application. It could be a measurement error. The point is that if the scientist had enough information then the anomaly could be explained. We are all familiar with magic. I am always amazed when I see a magician appear to make a large item like a 747 aircraft or an elephant disappear. I once even say (on television) a magician appear to make the Statue of Liberty disappear in front of a live audience. These are indeed unusual events, but they are based on sleight of hand or deliberate misleading of the audience. Magic is all about illusion—a clever trick. I recently saw a show that showed how some of these fantastic tricks are carried out. I was amazed at the extreme amount of effort that went into the illusion, but I was equally as amazed by how simple the illusion was once the “trick” was revealed. These events are generally associated with physical illnesses or other conditions that are caused or aggravated by a mental factor such as internal conflict or stress. The person suffering from such an illness is generally unaware of the cause. But it is possible that they can become instantly well when the mental stress or conflict is removed. Faith healing is often dealing with these psychosomatic issues. After all, some real medical conditions cannot be cured by mind over matter because they are not psychosomatic. I have noticed that the very ill are never healed by the faith healers. These include things like severed spinal cords or amputated limbs. The work of spiritual beings can also be classified as unusual events. Satan and his minions use their power to do evil, but they also attempt to counterfeit the good actions of God. For example, Pharaoh’s magicians, through the power of Satan, were able to imitate the first two plagues, but they were unable to imitate the third, which created life (lice; Exod 8:19). Only God can create life and raise the dead (Gen 1:21; Deut 32:39). More of Satan’s counterfeit miracles will be seen through the power, signs, and lying wonders done by the lawless one during the Tribulation (2 Thes 2:9). Christians (and other religious people) freely label most unusual events as miracles. These events, however, would be more correctly classified as God’s providence. Providential events are those events indirectly caused by God. These are events that God accomplishes using natural laws. Thus, the parking illustration given above is not a miracle; rather, it is the providential work of God. The same is true of getting a need rain shower at just the right time. The same is true of God providing financial support for a ministry. At TFL, we are praying from increased funding. When God provides that funding, it will not be a miracle, but God’s provision for His church. God uses providence to meet the needs of people and His creation. For example, was the resurrection of Christ a miracle? Some would claim that the resurrection was an anomaly because our knowledge is incomplete. Let’s evaluate that premise. If Jesus did raise from the dead it would have to be classified as a miracle because the event would demonstrate instantaneous power beyond natural capabilities, intelligent planning and purpose, and a moral purpose. God used this miracle to validate the truth of Jesus Christ as His begotten Son. This passage informs us that Jesus selected Peter’s boat to sit in while He taught the people waiting on the shore of the lake. When He was done teaching, Jesus instructed Peter to move out to deeper water and put out the nets. Peter obliged, but he pointed out that they had been fishing all night and caught nothing. Jesus demonstrates His instantaneous power by filling the nets to overflowing during a time of the day when fish are not caught. Could this have occurred naturally? Conceivably, it could have, but the nature of the miracle is in the “great number of fish” that were caught—so many that they filled and almost sank two boats. This is powerful. The second criteria for a miracle is that it must be done for a purpose. 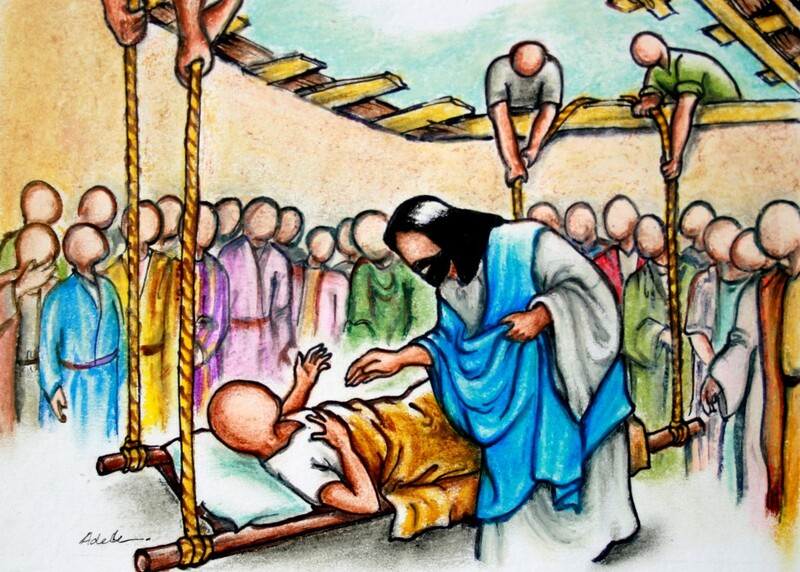 This miracle was done to demonstrate finally for Peter that Jesus is the Christ, the Son of God. Peter later makes this testimony regarding Jesus (Matt 16:16). Peter’s response to Jesus at this time is similar as that made by others who have come face to face with God. He realized with great fear his sinfulness (2 Sam 6:9; 1 King 17:18; Isa 6:5, etc.). Jesus was calling Peter to be a disciple. The third criteria is supported in that this miracle is demonstrating that Jesus is the Truth. Jesus would later say, “Jesus said to him, “I am the way, the truth, and the life. No one comes to the Father except through Me” (John 14:6, NKJV). The miracle presented here is about God’s goodness and His moral standard. Peter is being called into a new life of service to God. Jesus used this miracle to make Peter into a fisher of men. The unusual event presented by Luke is indeed a miracle performed by Jesus to launch His ministry of Truth. Why don’t we see Biblical miracles today? I have seen God work providentially but I don’t believe I have ever witnessed a true miracle. That doesn’t mean that God is not performing miracles; it merely means I haven’t seen one. God can do as He pleases and if He chooses to perform a miracle then He will. Many people feel as if they don’t experience miracles then they are not experiencing God. They believe the Bible is filled with miracles, therefore, we should see them today as well. The Bible does contain many miracles—perhaps 250 of them. Most of these miracles, however, occur during a very limited time. The greatest miracle happened at the creation. Other miracles occurred during the times of Moses, Elijah and Elisha, and Jesus and the early ministry of the Apostles. These were the times when God was revealing new truth and new messengers of the truth. Since the Bible is complete, God does not need to reveal additional truth. We will see more Biblical-style miracles during the Tribulation particularly when confirming the two Witnesses. Right now, there is no new message from God that needs to be confirmed, thus there is no need for miracles. You may ask, “So what?” True miracles are actually very rare. When we confuse the providence of God with miracles, we cheapen the true miracles of God. This issue becomes important when skeptics criticize the existence of God and the truth of His Word. If we call every providence of God a miracle, we allow room for the skeptics to raise serious doubt about Christians and their beliefs. In essence, we weaken the revelation God has given us. Since God uses miracles to confirm His message and His messengers, by claiming other unusual events as miracles the Word of God is blurred. Our challenge is to study God’s word and obey it. When we see true miracles in the Bible, we need to determine what message God is confirming or what messenger He is promoting. This is the proper way to study the Bible. Take time this week to examine some of the great miracles of the Bible and see how they point to the one True God and the message He has prepared for you. 1 Reply to "Miracles and the Work of God"
Thanks Pastor Jon! It helps a lot to understand “Providence” and “Miricles.” It also helps to know that there maybe around 250 miricles in the Bible detailed. Well, thats over 6000 years so although it may seem like there were a lot of miricles… in the grand scheme of things… there really werent and this shows miricles are very special. Prvidence as you explained and described it does happen though and if we are in tune with Christ, I think they happen a lot more than we know! Thanks again Pastor Jon…. Pastor Terrys sermon (if you havent heard it for this week) was excellent and worth the attention!